I've painted this before and I wanted to re-visit it to see if I could capture the light. 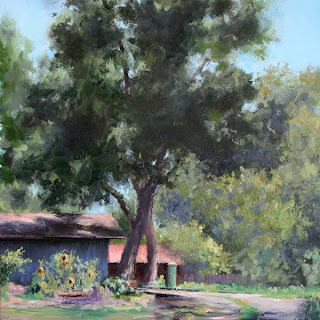 This is one of the places I painted when I took a workshop with Marc Hanson last year, it was a gorgeous setting. Wow.... You did an excellent job on the light especially through the tree. just lovely. That Oak is awesome. Love the moments of light and the wonderful shadow on the house with those happy Sun Flowers. This is such a solid composition. My eye goes directly to the tree, then down to the flowers then over to the blue in the background and full circle back to the tree. Just perfect! BEAUTIFUL painting, Teresa. Wonderful colors and textures. I hope that you and your mother are doing well. This is an amazing painting for such a small format, I would have guessed it was much larger. Beautifully painted. 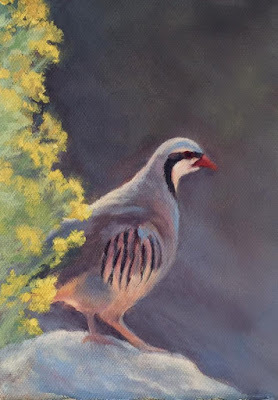 This is a beautiful painting Teresa! I feel like I am standing across the drive. You created a wonderful sense of atmosphere, well done!